September 23, 2010 – Oakland, Calif. – Children’s Hospital & Research Center Oakland announced today that the US Food and Drug Administration (FDA) has granted clearance of an Investigational New Drug (IND) application to introduce Trappsol® Cyclo™ (Hydroxypropyl Beta Cyclodextrin or HPßCD) into the brains of six year old identical twin girls dying of a rare brain-destroying cholesterol disease called Niemann Pick Type C (NPC). Known as “childhood Alzheimer’s,” NPC is a deadly progressive neurological condition that causes severe dementia and other debilitating symptoms in children. The FDAs approved use of Trappsol® Cyclo™ marks the first time in medical history that HPßCD will be delivered directly into the brain of a human being in an attempt to arrest a progressive and fatal neurological condition. Within days, Addison and Cassidy Hempel will travel from their home in Reno, Nev., to Children’s Hospital Oakland to start ongoing injections of Hydroxypropyl Beta Cyclodextrin (HPßCD) into their central nervous systems. 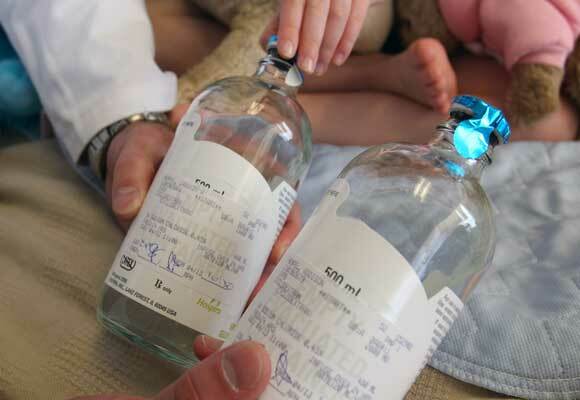 Initially, the twins will receive six cyclodextrin treatments of Trappsol® Cyclo™ via lumbar injection over a 12-week period. If Trappsol® Cyclo™ is well tolerated and no adverse side effects occur, the twins are then expected to undergo brain surgery to implant access ports allowing HPßCD to be delivered into the brain’s ventricle system. HPßCD is a ring of seven sugar molecules known as a cyclic oligosaccharide that is derived from starch. Derivatized cyclodextrins are used extensively in research labs to remove cholesterol from cultured cells and are well known in the pharmaceutical industry for their ability to solubilize drugs. Underivatized cyclodextrins are used throughout the food industry to make cholesterol-free products, such as fat-free butter, eggs and milk products. HPßCD is recognized as a GRAS (Generally Recognized As Safe) material for use in food products in Asian and European countries and is being considered for similar certification in the United States. Hydroxypropyl Beta Cyclodextrin, the chemical compound that will be administered into the twins’ central nervous system, is also an active ingredient found in Procter & Gamble’s Febreze® Fabric Refresher and is used to help eliminate odors from fabrics. Millions of people worldwide are exposed to small amounts of cyclodextrin compounds every day in food, cosmetics and household products. In April 2009, the FDA approved an Investigational New Drug protocol that allowed Addison and Cassidy Hempel to undergo weekly intravenous infusions of Hydroxypropyl Beta Cyclodextrin into their bloodstreams through a Medi-Port catheter implanted in their chest walls. However, research conducted by David Begley, PhD, a leading blood-brain barrier expert at Kings College London, discovered that Hydroxypropyl Beta Cyclodextrin does not cross from the bloodstream into the brain. While the Hempel twins have shown improvements with ataxia and have less difficulty swallowing following intravenous intervention with HPßCD, they continue to decline neurologically and there are no other treatment options available to save their lives. The twins have lost most of their ability to speak and are experiencing intermittent seizures and dementia; however, the girls can still walk, see, and communicate to their parents with a range of sounds and gestures. On June 13, 2010, Dr. Hastings filed a revised protocol to the Hempel twins’ Investigational New Drug applications with the FDA requesting permission to deliver Trappsol® Cyclo™ directly into the central nervous system of the twins in order to bypass the blood-brain barrier. Researchers studying Niemann Pick Type C afflicted cats and mice have discovered that when HPßCD is delivered directly into the brains of these animals, HPßCD has a remarkable life extending effect and appears to arrest the progression of this deadly neurological condition. It is currently unknown exactly how HPßCD is working to achieve these astonishing neurological effects in NPC animals or if it will have the same effect in humans. For Chris Hempel, mother of the twins, the start of cyclodextrin treatments into the central nervous system of her twins “creates new hope that was unimaginable even a few years ago for an ultra rare disease with a certain death sentence.” Since receiving the NPC diagnosis in October 2007, Ms. Hempel has worked tirelessly with doctors and researchers around the world to search for a lifesaving treatment for her twin daughters. In May 2010, she worked with Dr. Hastings to receive one of the few orphan drug designations granted by the FDA for the compound Trappsol® Cyclo™. Approximately 500 children worldwide have been diagnosed with double genetic mutations on the Niemann Pick Type C cholesterol gene, yet what scientists learn about these children may have implications that reach far beyond this ultra rare genetic cholesterol disease. Recent published research reports of the role for the NPC1 gene in Alzheimer’s disease and human immunodeficiency virus infection (HIV) make Niemann Pick Type C disease and gene research relevant to millions of people worldwide.